Today as I sank my toes into the warm sand and felt the gentle breeze gracefully sweep across my face, I saw you walking towards the waves. You were unrushed; your steps small and gentle as you stared in wonder at the ocean that stretched for miles ahead. You were a beautiful family of three, a triangulation of love completely balanced in joy as you watched your son play in the waves. My son played there as well. Your chair rested to my right, your legs outstretched to capture the tickle of the tide as it approached the shore. Your son’s laughter at the rising surf made me smile as the waves crashed around him; the simplicity of childhood captured in a fleeting moment of bliss. I watched your family and prayed for you. Today, in this moment, there were no worries. There were no fears. You reminded me that life doesn’t have to be complicated. We shared this space and reveled in the joy of watching our children play, even as the finite world around us raged with anger and hate. 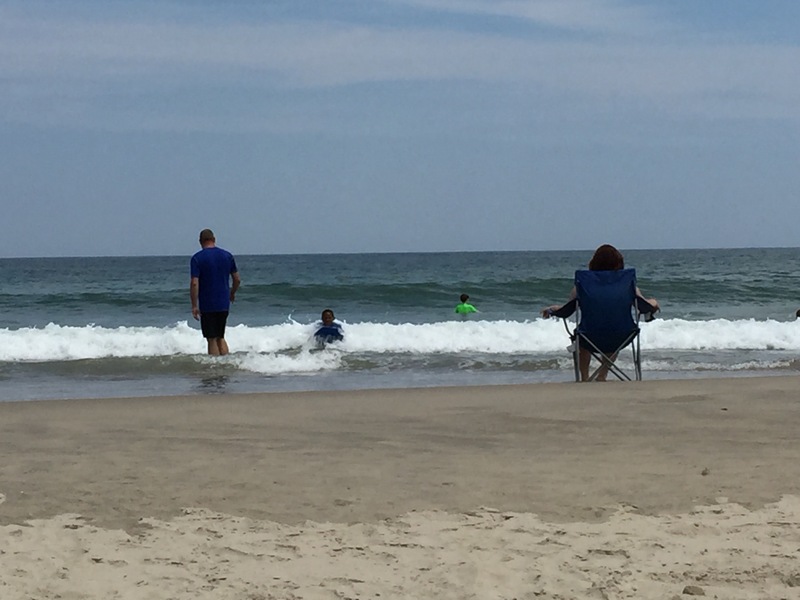 I know when you leave this beach, the crushing realities of raising a child whose skin color is much darker than yours may overshadow this moment. That is why I am writing this letter today. To remind you that your family is beautiful. To share the joy you brought to my heart today. To show that someone cares for you and your child. And in this singular moment of time, I wish I could wrap my arms around you, embracing all that you represent, showcasing to the world how perfect life can be. Do you remember the Night Before Christmas? The children, all tucked in their beds (sugar plums dancing in their heads) as they waited with anticipation for the surprises to arrive the next morning. St. Nick arriving, his belly like jelly, trying to tiptoe so quietly around the house, delivering gifts for others to enjoy. Participating in a Disney Cruise Fish Extender gift exchange is similar: the preparation, the anticipation, the surprise. Each morning as my children awoke, they jumped from their beds wanting to check their “stocking” to see if any treasures were left the night before. I reminded them that we weren’t officially part of the Fish Extender exchange, but participating as Pixie Dusters, so any gifts we received would be extras shared by generous families. Our purpose was to bless others without expectation of reward. But oh, how we were blessed in return! One family even surprised us with a handmade Disney bag which we used every day to carry our souvenirs, toys, and books from on-board activities and excursions. Sometimes the surprises arrived while we were sleeping; sometimes while we were eating meals. Each and every gift was appreciated, no matter the type or cost. I was reminded again and again about the kindness of others. Such thoughtfulness was shared with our little family of five. Remember, we weren’t even supposed to receive any gifts at all! I connected with the Fish Extender Facebook group literally three days before we left. And yet… so many families chose to add us to their list and bless us as if we belonged to them from the start. Even typing this blog post brings tears to my eyes, remembering the overwhelming feelings of love and gratitude. The gifts continued throughout the week. I was humbled by the thoughtfulness and creativity of others. One family gave an open-faced locket filled with Disney themed charms. I literally gasped with awe when I discovered the jewelry hidden in my Fish Extender pocket. My daughter kept meticulous care of her gifts, choosing to empty a clothing drawer so her treasures would be safe throughout the voyage. I simply cannot thank these strangers enough for the joy they added to our vacation. The entire Fish Extender experience showed my children first-hand the power of “give and receive.” We now have tangible treasures to remember your kindness and stories to share with others. You have woven your thoughtfulness into our family memories which will be retold for generations to come. You have blessed us beyond measure! If you are planning to take a Disney Cruise and love the idea of random acts of kindness, I recommend you to join the Fish Extender Facebook Group to get more information. (This is a closed group, so you will need to request to join.) The passengers on my cruise created their own closed group which allowed us to share information on a Google Sheet and post photos/memories from our trip. A special thank you to the following families for all our gifts received (if I left anyone off the list, please let me know and I will add you!) You truly transformed an already fabulous vacation into something only Walt Disney himself could create. As we boarded the Disney Cruise, we could barely contain our excitement – it was almost time to put up our Fish Extender (FE) and start giving our gifts away! (For those that are new to this blog, you can read more about Fish Extenders here.) We had a list of 10 families – 41 people people in all, and bags of small gifts organized by cabin number. Since everyone’s luggage would arrive at various times throughout the day, we had to wait a bit before we could RAK the others. We hung our FE outside our door with hopes that someone would Pixie Dust us during the week. We decided to RAK a few families each day and agreed that if their FE was filled by someone else we would try again when it was empty. Oh, if you could have been a fly on the wall to see us trying to hide our treasures as we walked through the narrow halls, always wondering if we were passing by the family we would soon bless. We felt like spies on a recon mission! The first door we came to had a fun surprise for us – a magnetic scrabble board on their door! We added our word “fun” and filled their FE. Then we went up a floor and filled a few more. Walking back towards our cabin, we talked about who to RAK and made a plan for organizing their gifts. Then, as we turned the corner, we received our own surprise – someone had blessed US by filling our fish extender in the short time we were away! The kids were SO excited and couldn’t wait to see what treasures were hidden in their FE pockets. Little did we know, this was the first of many gifts we would receive throughout the week! Check back tomorrow to see a sample of the FE treasures we received – it was like Christmas morning each time we returned to our cabin! As many of you know, our big vacation last summer was taking an Alaskan Disney Cruise. One of the awesome things about taking a Disney Cruise is this secret RAK experience called “fish extenders”, which I blogged about here. While that blog post gave an overview of the fish extender process and showcased the fish extender I made, I never told you what happened next! Since I was late in joining the Fish Extender Facebook group, I was put on a list of “Pixie Dusters”, which meant our family would receive random gifts that others had as extras (we were too late for the official gift-swapping exchange.) I, however, had a secret plan of my own. I decided to RAK fish extender gifts to every person/family that “liked” my Pixie Duster post on the page. We ended up with list of 10 families – 41 people in all. Did I mention that we less than 72 hours before our plane would depart? My two boys found pictures of Disney characters online and started recreating them out of Perler beads. My daughter grabbed her paint brushes and started decorating picture frames. I headed to the store to see what small gifts and Disney-themed trinkets I could find. We spent the next three days making, organizing, printing, and gluing so we would be ready to give our gifts away. We prepared memory-making gifts for elderly grandparents and baby-safe gifts for tiny infants. We bought sparkle nail polish for the teenage girls and painted Mickey Mouse ears on the side for fun. We had beads. We had stickers. We had journals, pens, and more. Once everything was spread out and sorted, we packaged the gifts in family bags with a personalized note attached. We even packed a huge bag of truffles to bless the Disney Cruise workers who would make our vacation so special. The next blog post will share all the fun we had blessing others – check back soon and feel free to share!